I have been in Edmonton for almost ten years (PhD study and then postdoc of University of Alberta). 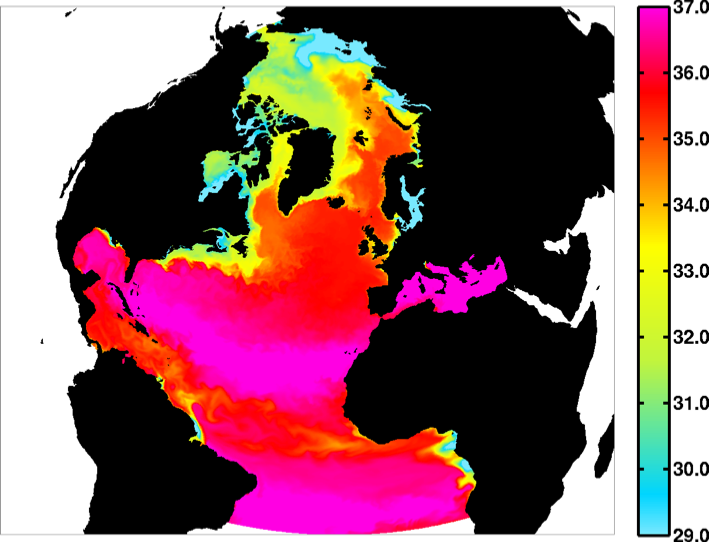 When I tell people I am studying (physical) oceanography, they always laugh at me. I wish I had a perfect answer when they ask me “Why are you studying the ocean here? There is no ocean in Edmonton.” Physical Oceanography sounds strange to most, so I always “hide” the physical part in the name. Well, there are too many things I can’t explain to them well enough. I count myself as an oceanographer but I don’t swim. Actually I prefer to move upward as I do climbing …. My friends joked that that I am preparing for the sea level changes. We know the sea level changes slowly, so one step higher might be the most efficient way (selfish though) to step away from the sea level rising problem. With very little experience at sea, I am working with computers most of the time. Yes, I am one of them, the mysterious numerical ocean modellers. I have been working with the NEMO model (same name of the famous little fish) for years. To be more specific, I mainly do simulations with a regional configuration called ANHA. Someone once asked, “Is ANHA your girlfriend?” Of course, he was joking. ANHA stands for the Arctic Ocean and Northern Hemisphere Atlantic configuration. However, he was also right. To me, when you opt to sacrifice your personal time on one thing, it could be love; otherwise, it is just a one-way “benefit friendship”. Sorry for drifting too far away, which is also a common problem in numerical modelling. Let’s pull it back to the ocean. My concern of the ocean is the salt. Life needs more salt, however, an ocean modeller may not agree because more salt leads to the model drift, particularly in the high latitude, which makes people feel bad for models. However, sometimes, it is not necessarily the fault of the model itself. The ocean is thirsty. If there is little river discharge and rain, the Arctic Ocean and Atlantic Ocean salinity could look something like figure 1. Well, let’s feed the ocean with a reasonable amount of river discharge and precipitation, and the ocean looks much better (figure 2). Look (figure 2), can you see the freshwater plumes from the the big rivers? I was very excited to “see” these rivers showing up in the simulation. Meanwhile, a picky person like you may also notice the fresh water around southern Greenland. Yes, we can assume Greenland is just a rock island in the model. But we know the Greenland Ice Sheet (GrIS) is melting and feeding the surrounding ocean with a large amount of freshwater. Here we must give Jonathan Bamber credit for his freshwater estimates from the Greenland Ice Sheet. The ocean is pretty happy with the freshwater from Greenland, thus, it is willing to tell us more about her, even the secret pathway of the Greenland meltwater (figure 3). Not a big surprise, it agrees with the general ocean circulation in this region as we know it. 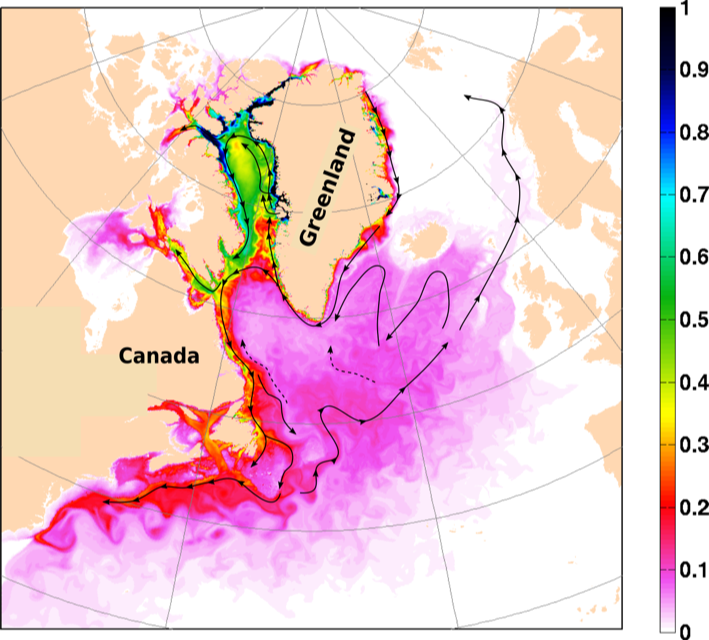 However, did you ever think about the spatial distribution, e.g., how much is accumulated in Baffin Bay and how far it can go down to south along the east coast of North America? The models do tell people something that is hidden behind what we see. In the end, a nice story was made, but still, there is no ocean in Edmonton…. Thanks for sharing you very personal feelings about oceanography and modelling. I can see that you have passion in both work and life.